The theme for the James Beard Foundation's 2013 awards ceremony was Lights! Camera! Taste! : Spotlight on Food & Film. In her opening remarks, Susan Ungaro, president of the James Beard Foundation, congratulated the nominees and thanked the sponsors. She also mentioned that in keeping with this year's theme, the food at the reception would be inspired by the movies. Actor Oliver Platt hosted the ceremony, which also featured movie montages of food-focused scenes. Emeril Lagasse received a standing ovation when he took to the stage to accept his award for Humanitarian of the Year. In his speech, he said the "world cannot evolve if it does not give back...Knowledge is power and I want to share that." He thanked the donors and left with his signature "Bam!" In addition to the categories below, the James Beard Foundation also honored "America's Classics," presented by Coca-Cola. This year's restaurants included Keens Steakhouse in New York, Prince's Hot Chicken Shack in Nashville, Kramarczuk's in Minneapolis, Frank Fat's in Sacramento, and CF Folks in Washington, DC. 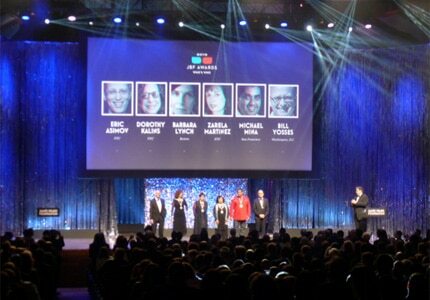 The inductees to the Who's Who of Food and Beverage in America were author Eric Asimov, editor Dorothy Kalins, chef/restaurateur Barbara Lynch, chef/restaurateur Zarela Martinez, chef/restaurateur Michael Mina, and author/pastry chef Bill Yosses. Cecilia Chiang, who arrived in America in 1958 and was the proprietor of The Mandarin in San Francisco for decades, received the 2013 Lifetime Achievement Award. She described James Beard as a dear friend. "He dedicated himself to American food but loved Chinese food and told Americans there is more to Chinese food than chop suey," she said. Describing the experience as "insane," Bowien dedicated his award to his mother, father and wife. Monis thanked his family for showing him "how vegetables grow and where eggs come from." Garrelts called his wife "the reason for who I am." In his acceptance speech, Dufresne said: "Thank you to my staff. This medal belongs to you." Kelly attributed her success to her farmers, foragers and cheese makers. Rucker's colorful remarks included thanking his wife for "not giving me too much s*&% when I come home — This is for you, baby!" Frasca Food & Wine, Boulder, Colo.
Bobby Stuckey expressed his gratitude to Thomas Keller. He had worked with the famed chef before leaving to open Frasca. The Barn at Blackberry Farm, Walland, Tenn.
Merry Edwards, Merry Edwards Wines, Sebastopol, Calif.
Edwards said the foundation had given her a great gift as her birthday is tomorrow. See GAYOT's exclusive interview with Vice President Mitchell Davis of the James Beard Foundation.